St. Joseph's Foundation receives and manages funds given by donors to benefit St. Joseph's Hospital and Medical Center in Phoenix, Arizona. St. Joseph’s Foundation was established in 1981 to raise funds for the hospital’s charity clinics. Its mission was later expanded to include all areas of St. Joseph’s. 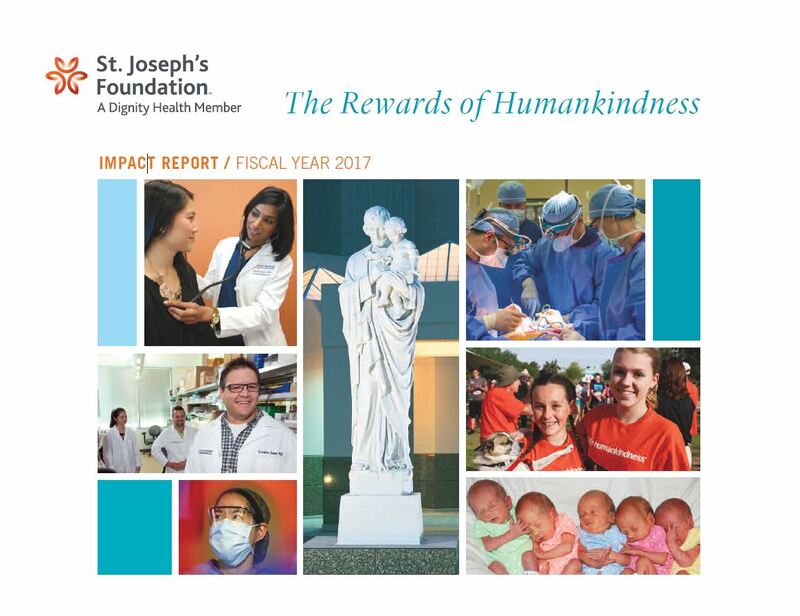 Today, St. Joseph's Foundation raises millions of dollars each year for patient care, medical education, community outreach, research, and care for those in need at St. Joseph’s Hospital. A board of directors, made up of community leaders who serve on a voluntary basis, governs St. Joseph’s Foundation. St. Joseph's Foundation is a not-for-profit organization, as provided under Section 501(c)(3) of the Internal Revenue Code - view our form. Contributions are tax-deductible in accordance with state and federal law. A complete list of the St. Joseph's Foundation staff is available so that you can learn who we are and the best ways to get in touch with us. We'd love to hear from you! We're hear to help. Whether you have a question about making a planned gift, organizing an event, donating to an area of special interest to you or any other subject related to supporting St. Joseph's Hospital, we'll be happy to answer it. Find the best ways to reach us. Find yourself wondering about who we are or what we do? We have answers for you in our FAQs section. With a strong foundation, there’s nowhere to go but to the next level. That is what your gifts are allowing us to do.